The Permanent High Court-at-Bar has lifted the overseas travel ban imposed on former Defense Secretary Gotabaya Rajapaksa for the period of one month from December 14. The case was taken up before the Permanent High Court judge bench consisting of Justices Sampath Abeykoon, Sampath Wijeratne and Champa Janaki Rajaratne this morning (09). The judge bench ordered to release the passport of Gotabaya Rajapaksa, which is currently in custody of the court and ordered the Controller General of the Department of Immigration and Emigration to temporarily lift the overseas travel ban imposed on the defendant. 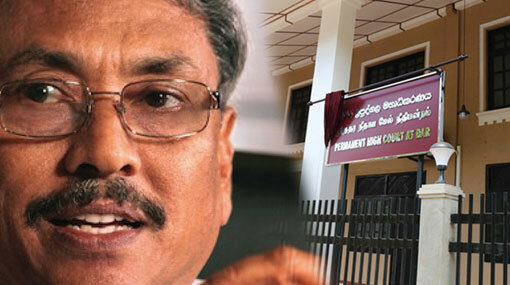 Furthermore, Gotabaya Rajapaksa was ordered to return the passport on his return to the country. Presenting submissions, Deputy Solicitor General Dileepa Peiris stated that the prosecution would not object the temporary lift of the travel ban imposed on the defendant, if the defense is ready to be liable for conducting the hearing of the case in the absence of the defendant during the time period of his overseas visit. Representing the defendant Gotabaya Rajapaksa, President’s Counsel Ali Sabry stated that the prosecution has not yet submitted certain documents related to the case to the defence. Responding to this claim, Deputy Solicitor General Dileepa Peiris stated that the prosecution would take necessary measures provide the defense with all the documents that could be handed over virtually. Subsequently, the Special High Court judge bench ordered that the case would be taken up again on November 27 to confirm whether the defense has received all the necessary documents. Former Sri Lanka Land Reclamation and Development Corporation (SLLRDC) Chairman Prasad Harshana de Silva, former members of the board of directors of SLLRDC Badrawathi Kamaladasa, Sudhammika Atigala, Saman Kumara Galappatti, D. Mendis Saliya, and Mallika Kumari Senadheera have been named as the other six defendants of the case. The case against the former Defense Secretary and six others was filed by the Attorney General’s Department for the alleged misuse of state funds amounting to Rs 49 million when constructing the D.A. Rajapaksa Museum and Memorial in Medamulana.